It can be challenging to know what type of medication to use and at what dose—whether it be in the clinic or at home for longer-term care—and there is a lot of information available that isn’t the easiest to interpret. This article reviews some common types and dosages of pain medications used to provide analgesia to birds, reptiles, and exotic companion mammals. When treating birds, always keep species in mind. A hawk is neither the same as a parrot nor the same as a chicken, and all three require different doses and even different medications to have the same efficacy of analgesia. Most of the research into avian pain medications has been done in raptors, in a single species of parrot called the Hispaniolan Amazon, and in chickens. When treating other birds, we usually extrapolate and assume they will react similarly to these related species. If your practice sees columbiformes (e.g. pigeons and doves), ducks, pheasants, turkeys, or any other bird species, it’s likely you will base your choice of drug and dose on what is reported in raptors, chickens, and/or parrots. The first and often hardest task is determining whether an avian patient is in pain. One simple rule of thumb is just to anthropomorphize—if the condition would result in pain in a human, it’s safe to assume a bird would be in pain, too. As a general rule, birds hide signs of pain and illness until it becomes severe. Some indicators of a sick bird include fluffed feathers, closed eyes, lethargy, or inability to perch. This African Grey parrot is fluffed and has a hunched posture, both of which are signs of a sick bird. Additionally, there is regurgitated material on the sides of the cage, which is indicative of nausea and discomfort. 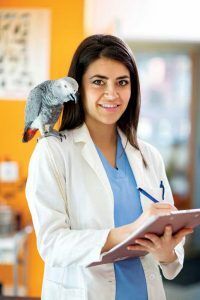 Parrots have been shown to have predominantly kappa opioid receptors (KOR), and thus butorphanol is a much more effective analgesic in these species versus utilizing pure mu opioids. Nalbuphine is also a kappa agonist that has shown to be effective in parrots, but is not generally commercially available. Doses for butorphanol range from 1-5 mg/kg; due to the higher metabolism in birds, dosing must be repeated every two to four hours. Some studies have shown tramadol can be effective at 20-30 mg/kg orally every six to eight hours (Sanchez-Migallon Guzman et al. 2012). Raptors, on the other hand, have predominantly mu opioid receptors and thus are provided analgesia with the standard mu opioids. Hydromorphone IM can be used at 0.3 mg/kg every three to six hours, and buprenorphine IM used at 0.1-0.3 mg/kg every three to six hours (Guzman et al. 2013; Ceulemans et. al 2014). Significant sedation can arise at higher doses, which can be a benefit depending on the situation. Studies have shown that doses ranging from 5-15 mg/kg of tramadol may be effective in bald eagles, American kestrels, and red-tailed hawks (Guzman et al. 2014; Souza et al. 2009; Souza et al. 2011). Meloxicam is the most common nonsteroidal anti-inflammatory drug (NSAID) used in birds. However, it is poorly available when given orally, and combined with the fast metabolism of birds, must be used at much higher doses than in dogs and cats. For parrots, a dose of 1.6 mg/kg every 12 hours is typical and generally well tolerated with few side effects (Molter et. al 2013). In raptors, the dose is unknown, since only one study has evaluated the efficacy of meloxicam. Here, researchers used 0.5 mg/kg as the dose and concluded it was not high enough (Lacasse et al. 2013). As such, we typically extrapolate from parrot studies. Tolerance studies performed in American kestrels utilizing 20 mg/kg showed no significant changes on necropsy after use of meloxicam every 12 hours for a seven-day period (Summa et al. 2017). Flunixin meglumine and carprofen are not particularly effective in psittacines in experimental studies and are not recommended for those species. Reptiles can be difficult to evaluate for signs of pain, more so even than other ZCA species. Predatory or carnivorous reptiles, such as monitors, can become more aggressive when experiencing pain. Chelonians (e.g. turtles, tortoises, and terrapins) may stretch out their necks, close their eyes, gape their mouths open, and/or bite. Lizards tend to show postural changes, such as arching the back, head pressing, and tucking the coelom, and also may flick at the painful area. Snakes become restless and agitated, may be easily startled, and may tuck away or toward the painful location. As with birds, if a disease or condition would be considered painful in a human, it’s safe to assume it would be painful to a reptile and require pain-relieving treatment. The posture of the bearded dragon seen on the left is flat and orbital tightening is present. Both these signs improve with pain management, as seen in the photo to the right. The wide variety of taxa in reptiles makes it difficult to extrapolate research from one species to another. Even among chelonians, for example, some species can be more sensitive and others more resistant to the effects of a given drug. If you are familiar with a particular species and know what their normal behavior looks like, you will have an easier time judging whether a drug has produced too much sedation in your patient. Additionally, keep in mind the presence of the renal portal system in these species, which makes it difficult to get consistent or reliable absorption and distribution of a drug administered into the pelvic limbs. Due to this system, it is recommended to administer injectable medications into the forelimbs only. Opioids and NSAIDs are the most commonly used pain medications in reptiles. Opioids can cause severe respiratory depression, so it is preferred to give doses in the morning, which allows the animal to be monitored throughout the day for apnea. Additionally, warmer temperatures during the day assist in metabolizing the medications you are administering. When experiencing pain, chelonians (e.g. turtles, tortoises, and terrapins) may stretch out their necks, close their eyes, gape their mouths open, and/or bite. Chelonians and lizards appear to have predominantly mu opioid receptors, and so respond to mu agonist drugs. In chelonians, morphine is effective, but the dose varies with species, so caution must be taken when extrapolating. In bearded dragons, morphine administered at 10 mg/kg IM every eight hours induced satisfactory analgesia. Clinically, caution must be used with doses and frequencies this high, as sick and debilitated patients may experience more significant respiratory depression. Hydromorphone can be used at 0.5-1 mg/kg SQ or IM every 24 hours, and tramadol has been shown to be effective in a study performed in red-eared sliders at 10 mg/kg every 24 to 48 hours with minimal respiratory depression (Baker et al. 2011). Butorphanol has been shown to be ineffective in lizards and is not recommended for analgesia (Fleming and Robertson 2012). In snakes, some evidence suggests they may be different from chelonians and lizards in their response to opioids. One study found corn snakes—which is a colubrid species of snake—responded better to butorphanol than to morphine. The dose range for butorphanol is wide—10-20 mg/kg IM every eight to 24 hours—and patients should be monitored closely for their respirations, as each species can respond differently (Sladky et al. 2008). Two other studies evaluated fentanyl patches in ball pythons—a species of python—but got conflicting results (Kharbush et al. 2017; Darrow et al. 2016). Currently, the recommendation for snakes to provide analgesia is to administer pure mu opioids to boas and python species, and butorphanol to colubrid species of snakes to. A recent study evaluated dexmedetomidine as an analgesic in ball pythons. It suggested that utilizing a 0.1-mg/kg SC dose provided analgesia for at least eight hours, but not up to 24 hours (Bunke et al 2018). As with birds, meloxicam is the most commonly used NSAID in reptiles, although they require much lower dosages due to their slower metabolism. Studies are limited, so a lot of the dosing is based on extrapolation. In chelonians and iguanas, it is recommended to administer meloxicam at 0.2 mg/kg IM every 24 to 48 hours, so the same can be recommended for snakes and other lizard species at this time (Divers et al. 2010). There has been research and data published on facial grimace scales in mice, rats, rabbits, and ferrets, which can make identifying signs of pain somewhat more straightforward in these species compared to birds and reptiles. Posters with photos of facial grimace scales are available online (bit.ly/2P93uif) for some species. Keep in mind that caution must be taken to carefully evaluate each patient for signs of discomfort, as prey animals are prone to hiding their pain. Rather than having a fight-or-flight response, exotic companion mammals often exhibit a conservation withdrawal response, which can make them appear to be resting comfortably. It is better instead to rely on signs such as orbital tightening, ear position changes, nose and cheek changes, whisker position, and alterations in the shape of the nares to determine the presence and severity of pain. 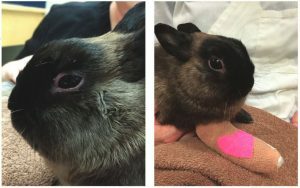 The photo on the left shows orbital tightening, a sign the rabbit is experiencing pain. The image on the right is after analgesia has been given. Few pharmacological studies are currently available assessing opioids in exotic companion mammals. We do know that butorphanol appears to be better for sedation rather than pain control, so sticking with a mu agonist for pain management is likely more effective. Additionally, morphine should be used with caution in herbivorous species, as it has the highest concern for potential alterations in gastrointestinal motility. Frequency of dosing is typically increased, due to the higher metabolism in these species. For rabbits and rodents, hydromorphone at 0.2-0.3 mg/kg every two to four hours appears efficacious, but hedgehogs and ferrets require a lower dose at 0.1 mg/kg, with the ferret needing repeat dosing every 2.5 hours (Katzenbach et al. 2018). Buprenorphine can be dosed every four to six hours, and the dose varies: 0.03 mg/kg is appropriate for ferrets, 0.05 mg/kg for hedgehogs, 0.06-0.1 mg/kg for rabbits, and 0.2 mg/kg for guinea pigs and other rodents (Sadar et al. 2018; Katzenbach et al. 2018). For oral administration, tramadol can be dosed every eight to 12 hours; the dose ranges from 4-5 mg/kg in ferrets and hedgehogs, to 15 mg/kg in rabbits, to up to 15-30 mg/kg in rodents (Souza et al. 2008). As with opioids, studies are somewhat lacking in pharmacological evaluations of nonsteroidal anti-inflammatories in exotic companion mammals. Meloxicam is the most commonly used NSAID, and as with dogs and cats, doses should be adjusted for animals that are older or have renal disease. Ferrets and hedgehogs adhere somewhat to small animal doses, and typically receive 0.2 mg/kg every 24 hours. From there, doses tend to be higher; chinchillas and guinea pigs are administered 0.5-0.75 mg/kg every 12 hours, rabbits 1 mg/kg every 24 hours, and rats and mice 1 mg/kg every 12 hours (Fredholm et al. 2013; Delk et al. 2014). With appropriate pain management, ZCA patients can recover faster and may have a better prognosis at home, regardless of their condition. Across all species, outcomes improve in many circumstances when adequate analgesia is provided and patients are comfortable. However, future research is needed to develop pain scales in nonmammalian species to allow for more objective and quantifiable assessment of pain. Further research is also needed to determine the most effective drugs and doses for many groups of ZCA species. For now, this article provides some general guidelines as to how you can achieve analgesia for ZCA patients in your daily practice. Guzman DS, Drazenovich TL, Olsen GH, Willits NH, Paul-Murphy JR. Evaluation of thermal antinociceptive effects after oral administration of tramadol hydrochloride to American kestrels (Falco sparverius). Am J Vet Res. 2014;75(2):117-123. Souza MJ, Martin-Jimenez T, Jones MP, Cox SK. Pharmacokinetics of intravenous and oral tramadol in the bald eagle (Haliaeetus leucocephalus). J Avian Med Surg. 2009;23(4):247-252. Sanchez-Migallon Guzman D, Souza MJ, Braun JM, Cox SK, Keuler NS, Paul-Murphy JR. Antinociceptive effects after oral administration of tramadol hydrochloride in Hispaniolan Amazon parrots (Amazona ventralis). Am J Vet Res. 2012;73(8):1148-1152. 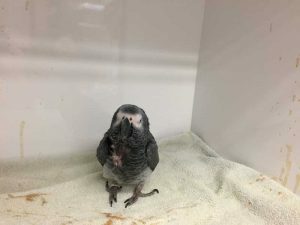 Molter CM, Court MH, Cole GA, Gagnon DJ, Hazarika S, Paul-Murphy JR. Pharmacokinetics of meloxicam after intravenous, intramuscular, and oral administration of a single dose to Hispaniolan Amazon parrots (Amazona ventralis). Am J Vet Res. 2013;74(3):375-380. Guzman DS, Drazenovich TL, Olsen GH, Willits NH, Paul-Murphy JR. Evaluation of thermal antinociceptive effects after intramuscular administration of hydromorphone hydrochloride to American kestrels (Falco sparverius). Am J Vet Res. 2013;74(6):817-822. Ceulemans SM, Guzman DS, Olsen GH, Beaufrere H, Paul-Murphy JR. Evaluation of thermal antinociceptive effects after intramuscular of buprenorphine hydrochloride to American kestrels (Falco sparverius). Am J Vet Res. 2014;75(8):705-710. Souza MJ, Martin-Jimenez T, Jones MP, Cox SK. Pharmacokinetics of oral tramadol in red-tailed hawks (Buteo jamaicensis). J Vet Pharmacol Ther. 2011;34(1):86-88. Summa NM, Guzman DS, Larrat S, Troncy E, Bird DM, Lair S, Fitzgerald G. Evaluation of high dosages of oral meloxicam in American kestrels (Falco sparverius). J Avian Med Surg. 2017;31(2):108-116. Lacasse C, Gamble KC, Boothe DM. Pharmacokinetics of a single dose of intravenous and oral meloxicam in red-tailed hawks (Buteo jamaicensis) and great horned owls (Bubo virginianus). J Avian Med Surg. 2013;27(3):204-210. Baker BB, Sladky KK, Johnson SM. Evaluation of the analgesic effects of oral and subcutaneous tramadol administration in red-eared slider turtles. J Am Vet Med Assoc. 2011;238(2):220-227. Fleming GJ, Robertson SA. 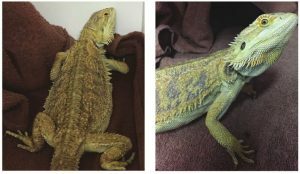 Assessments of thermal antinociceptive effects of butorphanol and human observer effect on quantitative evaluation of analgesia in green iguanas (Iguana iguana). Am J Vet Res. 2012;73(10):1507-1511. Sladky KK, Kinney ME, Johnson SM. Analgesic efficacy of butorphanol and morphine in bearded dragons and corn snakes. J Am Vet Med Assoc. 2008;233(2):267-273. Kharbush RJ, Gutwillig A, Hartzler KE, Kimyon RS, Gardner AN, Abbott AD, Cox SK, Watters JJ, Sladky KK, Johnson SM. Antinociceptive and respiratory effects following application of transdermal fentanyl patches and assessment of brain µ-opioid receptor mRNA expression in ball pythons. Am J Vet Res. 2017;78(7):785-795. Darrow BG, Myers GE, KuKanich B, Sladky KK. Fentanyl transdermal therapeutic system provides rapid systemic fentanyl absorption in two ball pythons (Python regius). J Herp Med Surg. 2016;26(3-4):94-99. Bunke LG, Sladky KK, Johnson SM. Antinociceptive efficacy and respiratory effects of dexmedetomidine in ball pythons (Python regius). Am J Vet Res. 2018;79(7):718-726. Divers SJ, Papich M, McBride M, Stedman N, Perpinan D, Koch TF, Hernandez SM, Barron GH, Pethel M, Budsberg SC. Pharmacokinetics of meloxicam following intravenous and oral administration in green iguanas (Iguana iguana). Am J Vet Res. 2010;71(11):1277-1283. Uney K, Altan F, Aboubarkr M, Cetin G, Dik B. Pharmacokinetics of meloxicam in red-eared slider turtles (Trachemys scripta elegans) after single intravenous and intramuscular injections. Am J Vet Res. 2016;77(5):439-444. Katzenbach JE, Wittenburg LA, Allweiler SI, Gustafson DL, Johnston MS. Pharmacokinetics of single-dose buprenorphine, butorphanol, and hydromorphone in the domestic ferret (Mustela putorius furo). J Exotic Pet Med. 2018;27(2):95-102. Sadar MJ, Knych HK, Drazenovich TL, Paul-Murphy JR. Pharmacokinetics of buprenorphine after intravenous and oral transmucosal administration in guinea pigs (Cavia porcellus). Am J Vet Res. 2018;79(3):260-265. Souza MJ, Greenacre CB, Cox SK. Pharmacokinetics of orally administered tramadol in domestic rabbits (Oryctolagus cuniculus). Am J Vet Res. 2008;69(8):979-982. Fredholm DV, Carpenter JW, KuKanich B, Kohles M. Pharmacokinetics of meloxicam in rabbits after oral administration of single and multiple doses. Am J Vet Res. 2013;74(4):636-641. Delk KW, Carpenter JW, KuKanich B, Nietfield JC, Kohles M. Pharmacokinetics of meloxicam administered orally to rabbits (Oryctolagus cuniculus) for 29 days. Am J Vet Res. 2014;75(2):195-199. Miranda Sadar, DVM, DACZM, is an assistant professor at Colorado State University’s College of Veterinary Medicine and Biomedical Sciences in Fort Collins, Colo. She graduated from Colorado State University with a BSc in zoology before earning a DVM degree from Colorado State University. Dr. Sadar completed an internship in zoological, exotics, and wildlife medicine at the University of Saskatchewan’s Western College of Veterinary Medicine. After finishing a two-year fellowship in wildlife medicine at the Wildlife Center of Virginia, she moved to Davis, Calif., and completed a residency in zoological medicine at the University of California. Sadar was an assistant professor at the Western College of Veterinary Medicine for two years prior to moving to Colorado. 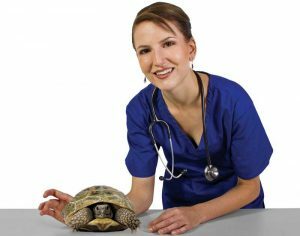 She is a board-certified specialist in zoological medicine with a focus on zoological companion animals. Sadar can be reached via e-mail at miranda.sadar@colostate.edu. Rachel Baden, DVM, is an intern in zoological animal medicine and surgery at Colorado State University. She graduated from UC Davis School of Veterinary Medicine in 2017, and did a small animal rotating internship at Louisiana State University before moving to Colorado. Dr. Baden’s particular interest is in avian medicine. She lives with seven birds who have their own room in the house. She can be contacted at rachel.baden@colostate.edu.